Over the summer I took a graduate course titled "Visual Culture and Studio Practice". Since it's an election year, political ads were a big focus. I've been thinking about how some ideas from that course could translate into the upper elementary Art room. The second assignment in my class was to design two different posters about political/social issues using a similar composition. We had to incorporate one of our photographic self portraits from the first assignment. Since I had taken a photo posing with a hayfork (I think, I'm not a specialist in farm tools) and conservation is important to me, I decided to make my first poster about conserving native plants. I used the phrase "preserve the prairie" first but decided that "protect the prairie" was a little more forceful and fit the tone of my photo better. 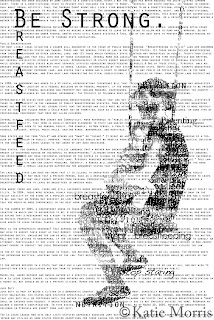 For my second poster, I decided to work with breastfeeding. I was still nursing my son at the time and there had been recent stories in the news about nursing mothers being treated unfairly. I think we have problems with this for two reasons. One reason is that there is a totally undeserved negative stigma with breastfeeding in our culture. People who don't understand think it's "icky". I think the second reason we have problems is women not knowing their rights. 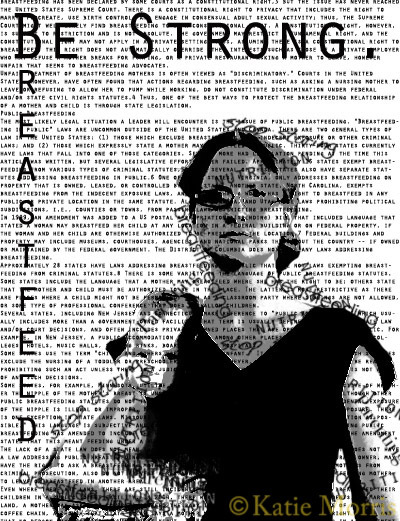 I wanted to make a poster that would encourage breastfeeding women to know their rights, and stay strong when faced with public "opinions". After I had finished the swing design, I found out that I had to start with the exact same photo, though it could be altered. After some problem solving, the poster below was what I turned in. So how could this be used in the classroom? 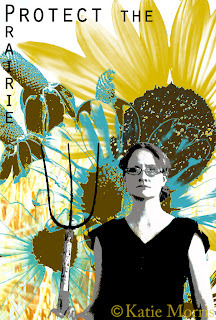 If you taught older students and had photoshop, you could have them incorporate a self portrait into a poster for an issue that is important to them. If the timing works out right with my older students, I'd really like to have make a poster with something like drawing, painting, or collage. The poster topic wouldn't have to be political, but I would ask them to chose something to promote. If you wanted to tie in with the election, I would have the students make a campaign poster promoting either a fictional candidate or themselves. The capstone assignment for my class was to produce a VIDEO campaign ad as if we were running for president. I've gotten comfortable photographing myself but video is a whole 'nother story. I was surprised that I was the only "candidate" in my class who used being an Art teacher as the main selling point. (One of my male classmates dressed in full theatre makeup as two opposing, mudslinging candidates in a pair of ads. It was pretty cool.) In my faux ad, I talked about standardized tests, turning STEM into STEAM, the 4 "C"s, and say that if we want to improve education, we should try putting an educator in the white house. In preparation for making our own videos, we watched a LOT of campaign ads (real and satirical). I know that there is a whole team running each campaign, but until I tried to make my own ad, I never thought about just how carefully wording is chosen, and how difficult it must be for the candidates to present themselves as they desire. I found it hard to achieve the right tone- trying to sound firm but friendly, down to earth but an expert. I filmed my video using an iPad and edited in iMovie. I wish I had something that would have allowed me to change the pitch of my voice for the voiceover, but honestly, I would probably feel awkward no matter what! How cool would it be to have students work in teams to create a video campaign ad? There are so many possibilities and I think it would help them be more aware of the strategizing that goes into the ads they see on TV. I can't believe I'm posting this video, because I feel pretty silly, but if you would like to see my faux presidential ad, watch below! Well done, Katie!I'd vote for you! Great art work Katie, and I love your ideas for incorporation into your curriculum! Love it! Everything you said is so true. 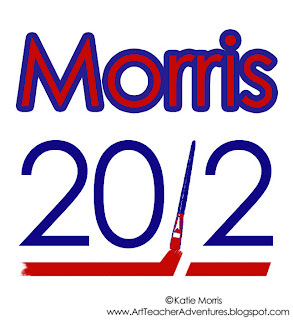 You'd get my vote too. Where did you take this course? Looks great. Are you working on your master's degree, or is this coursework for professional development? I'm working on my Master's in Art Educstion through the University of Nebraska at Kearney. Go Katie! That is a great video! Hi Katie, my name is Jacky and I am the creator of Mummie's Nummies. MN is a breastfeeding support blog and community. First off, I wanted to congratulate you on breastfeeding your little one and THANK YOU for spreading the support to others. I LOVE your breastfeeding posters! What got me was how UNIQUE they are! I have not seen anything like them before. I was wondering if I could share them with my readers? THANK YOU!! !